Expect design experimentation from the Total War Saga series. The 'Total War Saga' tagline represents a new category of full-size historical Total War games that take a tight focus on one particular historical flashpoint. In this case it's the period of instability that resulted when King Alfred beat back the Viking advance at the battle of Edington and the British isles turned into a massive Mexican standoff. If the first Saga game, Thrones of Britannia, is indicative of the trend for the rest of the series, this is the place where CA will do some serious experimenting with the Total War format. A few hours with the game recently revealed some big changes to recruitment, technology and character progression. The Thrones of Britannia strategic map is a massive play space that zooms in on the British Isles. The territory is subdivided into loads of intricate little provinces ruled by a wide range of factions, ten of which are playable, from Alfred's forces to the Gaels and, of course, the settled Vikings to the East. Provinces each feature a capital city surrounded by small, vulnerable satellite towns. Capitals have lots of building slots, walls, and garrisons, and in certain locations they have unique building trees that let you put up cathedrals, monasteries, and other historical landmarks. The little outer towns host mines and farmlands, but they are easily sacked if you want to put a resource squeeze on the enemy. The map feels big enough, but I found it very hard to read when I spent a couple of hours with the game. At a glance, it is hard to spot where one province ends and another begin, which is troublesome if you're trying to move armies around without trespassing. In Total War, you typically need to build advanced tiers of military building to unlock new troop types. In Thrones of Britannia, once you have built the archery school, for example, advanced versions of your basic archers must be unlocked via the technology tree. Once a unit is unlocked, an army in fortify stance can recruit them from a global pool anywhere on the map. However, you don't get the whole unit when you buy them in Britannia. Instead, you muster about a quarter of the unit's full potential size, and must spend a few turns mustering to get them up to full strength. "That's not to say you can't use them immediately," says Creative Assembly communications manager Al Bickham. "You can recruit all of those guys, hit recruit, spend the money, get those units in your army and go and have a fight, and there will be times when you'll want to do that." This plays better than it sounds, and it means that wealthy provinces can't magic up huge elite 20-stacks in a few turns. This change, in addition to the technology changes, are designed to simulate the process of training troops more realistically. “You can’t just start researching a thing, you have to start doing the thing, and learning a bit about it, before you can start researching” says Bickham. He uses archers as an example. You have to build ten archer units before you can start researching advanced versions. That goes for buildings too. Factions start out with certain limitations on three types of civic tech they can research. Irish factions are more interested in building churches than marketplaces, but if they move over to the trade-happy English counties they will encounter markets and have a chance to start unlocking market-related civic tech. However, building options are defined by a province’s location, so your Irish faction can’t then start building marketplaces in their home provinces once they have encountered the tech. The idea here is that building limitations create meaningful geographical differences. Fighting and building in the north should feel different to a campaign in Wales. I worry that the system might feel limiting in practice, though it does help to further differentiate factions. The Creative Assembly wants to emulate Total War: Warhammer to the extent that different factions should feel very different to play. 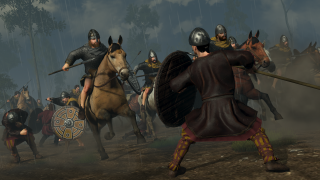 Thrones of Britannia features an advanced version of a war weariness feature introduced in the Age of Charlemagne expansion for Attila. If you spend a long time at war your people become fed up, and you start taking public order hits. In addition, Thrones of Britannia adds a war fervour state. "If you've been at peace too long your people get itchy feet and they want you to go out and fight in their name," says Bickham. "You get all these positive benefits for being in a state of war fervour and that means your armies get better at fighting, you get better public order around those territories." The system works on a sliding scale. The further you slip into war weariness, the more you might want to consider forging some treaties to give your people time to cool down. Dilemmas are big text pop-ups that ask you to make an important decision in your campaign. I was informed of an army of Sea Kings coming to take an allied territory to my east. I was offered a choice: take over the weak allied territory and hold it as a bulwark against invasion, or take on the Sea Kings directly. There was an option to ignore the dilemma, but I decided to take on the Vikings and soon was soon invaded by a powerful Sea King faction that caused me tremendous trouble. It made my neighbours like me more, at least. Dilemmas are supposed to create these interesting situations, give you some historical context, and offer you ways for your faction to become more powerful and achieve a win state. "Some factions, their entire narrative is driven through branching dilemmas. You can follow that to a victory objective as well, which will lead you up to a 'kingdom' victory objective. You'll make certain choices as you go. You can actually upgrade your kingdom several times to become ultimately the kingdom of Ireland, or the Kingdom of England. They provide tons of narrative, they hook in historical events that happened at the time, or reforms that happened at the time." Pop-up events keep you up to date on the political wranglings taking place throughout the isles. They are a more flavourful take on typical Total War notifications, the ones I always tend to click through in a few seconds without paying too much attention. Characters have three core stats: governance, command and zeal. Generals will develop the command stat as they roam around getting into fights. Your administrative heroes can enhance the performance of provinces under their jurisdiction with the command stat. Zeal acts as a multiplier for either stat. So far, this is quite familiar, but there are important differences to the way characters develop. Rather than acquiring followers through chance, in Britannia you assign a new follower to a character when they level up. Followers upgrade a specific aspect of the character. Quartermasters increase your movement speed on the campaign map and reduce troop upkeep costs. Priests can keep a character’s loyalty in check. The loyalty stat returns in Britannia, but there are new ways to manage disloyal characters. When you take a province you earn a collection of estates that you can dole out to upstart heroes. “Some guys are going to be awfully loyal, some are going to be dicks” says Al Bickham. If you haven't played Total War before some of these changes might seem minor, but they have a big impact on the flow of the game. New objectives give factions new ways to win that aren't simply 'take territory X', you have to put more thought into raising armies, and you don't need to pour gold into advanced tiers of military building. I found the internal politics of my faction especially entertaining, but I'll get into all of that in a broader hands-on account soon enough. Total War Saga: Thrones of Britannia is out on April 19. Creative Assembly will take to the stage at the PC Gamer Weekender on February 17 at 14.30 to discuss the game's new features.